Mammography Systems Market size was valued at USD 1.98 billion in 2017 and is expected to witness more than 7.5% CAGR from 2018 to 2024. Growing understanding and recognition of breast cancer screening tests in developed and developing countries, has been witnessed as a boosting factor for mammography systems market. There has been a visible decrease in the mortality rate of breast cancer in U.S. in past few years. For instance, there has been a 39% decrease in the mortality rate from breast cancer in U.S. due to rising awareness among the citizens and improved treatments. Awareness is spread through various campaigns, events and rallies. Governments of numerous countries are promoting free breast cancer check-ups and will serve to be high impacting factor that driving the market growth during the forthcoming years. Significant rise in the number of breast cancer cases throughout the world in past few years that will considerably contribute to growth of mammography systems market. Breast cancer attributes to 11.9% of all forms of cancer that account for 1.7 million cases throughout the world. The major causes of breast cancer can be grouped as decreased number of child bearing, excessive weight and genetic factors. Additionally, an exploding geriatric population worldwide will result into more risk of breast cancer that is associated with age of women, propelling mammography systems market growth. A wide range of advanced technologies with better screening efficiency are available by notable companies such as Hologic, Siemens Healthcare, Fujifilm and other players. The major advantages offered by these novel technologies are reduced exposure to radiations, superior detection of invasive cancer and decreased issue of breast compression. These factors will provide lucrative growth to mammography systems market during the forecast timeline. However, there is a huge capital associated with mammography systems owing to advent of newer technological systems that impair the market growth. Additionally, false-negative results leading to delay in the treatment of breast cancer will restrain industry growth to some extent. Full Field Digital mammography (FFDM) systems segment dominated the industry in 2017 with a market share of 67.4% and continue to grow over forecast period. The growth is attributable to its increased detection rate of malignant breast cancer coupled with lesser relative cost compared with breast tomosynthesis system. There is a 40% decrease in the radiation dose for FFDM system along with convenient result display on digital platform such as computer-aided design (CAD) and Picture Archiving and Communication System (PACS) that will further accelerate industry growth during the forecast timeline. Breast tomosynthesis segment is projected to grow at fastest rate of around 9.7% CAGR during the forecast period. Its sharp image outcome and decreased recall rates makes it superlative product. Moreover, increased diagnosis and adoption rate will stimulate segment growth over the coming years. 2D mammography contributes to the largest market share of the technology. 2D mammography technology has the capability of detecting breast cancer also in dense breast tissue. Also, 2D mammography is widely used in synthesized mammography and breast tomosynthesis systems. It yields superior results, leading to broader use of this technology, thereby accelerating the segment growth. 3D mammography technology is a novel technology producing more detailed images of the breast tissue. This technology captures breast images at various angles and multiple slices. This feature enables proper interpretation of results and thereby decreases false-positive outcomes. Aforementioned factors will lead to rapid market growth during the forthcoming years. Hospitals segment contributed for 64.4% of mammography systems market share in 2017 and is expected to grow during the forecast period. A large number of breast cancer patients as a result of increased disease prevalence contributes to a large number of hospital visits for diagnosis by mammography systems. Suitable reimbursements and attractive healthcare facilities coupled with considerable rise in disposable income will further drive the segmental growth. Ambulatory surgical centres segment of mammography systems market is anticipated to witness highest growth rate of 8.2% over the forecast period. This is attributable to the increasing patient pool suffering from invasive breast cancer & favourable reimbursement policies assisting patients to undergo expensive diagnosis. Emergence of healthcare facilities and increased affordability of population owing to rising disposable incomes will propel segment growth in coming years. North America dominated the mammography systems market with market share of 33.4% in 2017 and is projected to grow at a significant rate over the forecast period. This can be attributed to huge breast cancer patient population coupled with increasing prevalence of factors leading to breast cancer, such as obesity, alcoholism, hormone replacement therapies and growing elderly population. Favourable reimbursement policies and faster adoption of technologically advanced mammography systems will fuel regional growth during forthcoming years. Asia pacific mammography systems market is estimated to witness fastest growth rate of around 9.0% during the forecast period owing to rising incidence of breast cancer. Growing disposable income and developments in healthcare facilities in emerging economies will boost the regional growth. Furthermore, increasing number of awareness initiatives leads to greater demand and adoption of mammography screening tests, thereby accelerating demand for mammography systems throughout the forecast period. 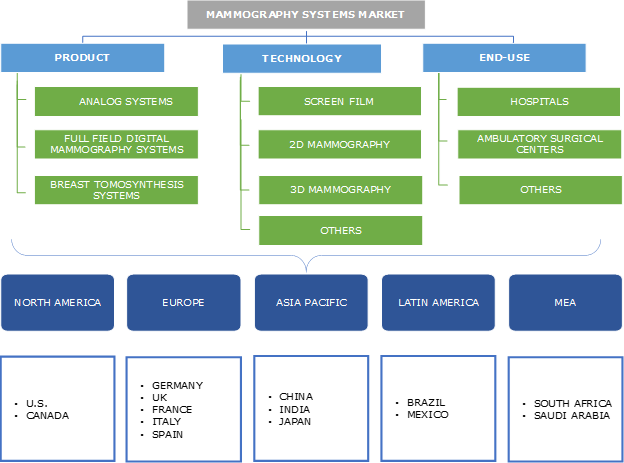 Some of the key industry players operating in global mammography systems market are Amico JSC, Canon, Carestream Healthcare, Fujifilm, GE Healthcare, Hologic, I.M.S., Konica Minolta, Korean C, Medical Technologies, Planmed Oy, Philips, Siemens Healthineers. Industry players are focusing on collaborations and new product introductions through advancement in technology to strengthen and enhance the product portfolio. For instance, in June 2017, GE Healthcare collaborated with hospitals and launched its Senoghrape Pristina that provides comfort to patients and lowers the operational costs, enhancing financial stability of the company. Ascending prevalence of breast cancer in women aged 50-69 years along with changing lifestyles and habits will drive global mammography systems industry. Expanding awareness about breast cancer, globally will further supplement industry growth over the forecast timeframe. 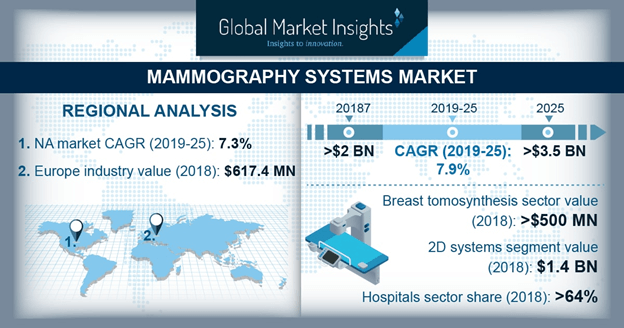 Availability of cutting-edge technology resulting into more accurate diagnosis will further impel the development of mammography systems market.